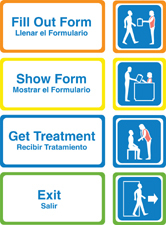 Below is a complete list of signs you can use in health care and medication centers. Advice about ways to use the signs can be found on the page about planning these emergency centers. The signs may be available in multiple languages, different formats. You will be able to customize the signs for your jurisdiction or facility. Adobe InDesign format: High-quality files for printing larger signs through your local print-shop or customizing the signs for your location. PDF format: For printing to smaller format printers or plotters.